Jose Toconas, 45, shows the drying marijuana plants grown out at his home in the mountains of Tacueyo, Cauca, Colombia, Feb. 10, 2016. Those simple economics will be one of President Juan Manuel Santos' biggest problems as he seeks to eliminate illegal drug production with the help of FARC rebels now that the two sides have agreed a peace deal to end half a century of conflict. 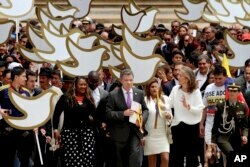 Colombia's President Juan Manuel Santos carries to Congress the peace deal with rebels of the Revolutionary Armed Forces of Colombia, FARC, in Bogota, Aug. 25, 2016. Under the peace accord, unveiled by both sides on Wednesday, FARC leaders pledged to work with the government to eradicate coca and marijuana production in areas they have controlled, help farmers switch to legal crops and foster development in long-neglected, poor rural areas. But that leaves the door open for other trafficking groups to replace the FARC, which have for decades taxed growers and drug dealers, taken a hefty cut of profits from local and overseas sales and at times traded directly with powerful Mexican drug cartels. Crime gangs and another Marxist rebel group, the National Liberation Army (ELN), are already moving into Cauca and other drug trafficking hot spots where poor growers of marijuana and coca, the raw material for cocaine, sell to the highest bidder. "I'd rather keep growing," said Toconas of his marijuana crop. He says he switched out of coca cultivation 10 years ago when the government's fumigation program made it too risky. The government says it will move quickly to try to stop other gangs expanding their drug operations. "In territories left vacant by the FARC we have to fill the space immediately because organized crime will get there quickly," Defense Minister Luis Carlos Villegas told Reuters. Trafficking of cocaine and marijuana has been a scourge in Colombia since the 1980s, when the country's most famous trafficker Pablo Escobar earned billions and used bombings and assassinations to protect his cocaine empire. While no one has been able to match the power and wealth that Escobar enjoyed before he was shot dead by police in 1993, the industry remains lucrative. The government has stepped up its offensive against gangs in recent months as the Clan del Golfo, formed by former right-wing paramilitaries who were demobilized in a previous peace deal, ook advantage of a FARC ceasefire to gain new territory and smuggling routes. 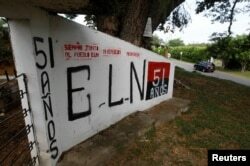 A graffiti, of rebel group Army Liberation National (ELN) is seen at the entrance of the cemetery of El Palo, Cauca, Colombia, Feb. 10, 2016. The mountain road from El Palo to Toribio in FARC-dominated Cauca is already daubed with fresh graffiti proclaiming the ELN's arrival, and residents complain they are hassled by the trafficking gangs. Today's most successful crime gangs formed after a 2006 peace accord with paramilitaries failed to absorb thousands into society. Some FARC fighters already shift their allegiances between the two rebel groups and crime gangs, said Alcibiades Escue, Toribio's 53-year-old mayor. "By day they wear the FARC insignia and by nightfall they've switched to the ELN," he said, only half joking. Many residents here are skeptical. "Even if peace is signed there won't be peace," said Jeymi Orozco, 19, who helps pack marijuana for dealers at her adobe shack on the road to Toribio. "They will all come, all the gangs. And if the government tries to eradicate coca and marijuana there will be more struggle," she says of the problems that could arise if their livelihood is removed. Workers who collect coca leaves, known locally as "raspachines," carry bags with harvested leaves to be processed into coca paste, on a coca farm in Guayabero, Guaviare province, Colombia, May 23, 2016. While most marijuana and coca farmers are poor, it is a profitable business higher up the chain and the FARC has earned billions of dollars from it over the years. The government has promised to provide subsidies to get legal production - of citrus fruits, coffee and beans - started, as well as investment in roads and education. But the mountains of Cauca - and most areas with illegal crops - are far from the reach of the state. Dirt roads are often washed away by rain, making it difficult for farmers to make a living selling legal crops. With coca and marijuana, FARC agents come to the farms to collect the goods. Mari Teteche, 42, prepares marijuana harvested in the mountains of Tacueyo, Cauca, Colombia, Feb. 10, 2016. Luz Mari Teteche, 42, earns about 36,000 pesos ($12) daily as a so-called hairdresser, trimming the leaves from marijuana flowers using kitchen scissors and bagging the buds in sacks. Hidden behind plastic tarpaulins, she works her fingers raw about 12 days a month to feed her family. "This pays better than coffee and it has more harvests a year than coffee," she says, reaching for another marijuana ranch from the stack at her feet. "The government will have to give big subsidies for people to stop this work." Many question how Colombia will fund crop replacement programs and infrastructure projects given the slowing economy is already facing a massive shortfall in revenue as oil prices slump. U.S. financial support under the so-called Plan Colombia to combat rebels and drug gangs has also been reduced. View of a marijuana field in the mountains of Tacueyo, Cauca, Colombia, Feb. 10, 2016. At night here, the lush valleys are ablaze with electric lamps that ensure the marijuana grows quicker, and flashy four-wheel drive pick-ups roll non-stop along dirt tracks, their back ends filled with sacks of marijuana and coca leaves. "Crime gangs are probably drooling - but they should be worried too," said Eduardo Diaz, head of the president's crop substitution program, highlighting the government's tougher stance on the gangs. 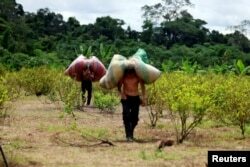 While Colombia has had patchy success in its fight against illegal drugs - a $10 billion effort by the United States did little to dent coca cultivation - Santos is betting a beefed-up campaign against criminal networks will keep them in disarray long enough to prevent a move on the FARC's drug business before farmers accept a switch into legal crops. He recently authorized air raids against crime gangs, a move that was key to combating the FARC. "Peace won't bring an end to the criminal activities of today," said General Jose Mendoza, head of the anti-narcotics police. "We have to keep fighting."